Diversity used to be a box that companies checked. But today, it’s a real competitive advantage. According to the Global Recruiting Trends 2018 report, companies are prioritizing diversity to build stronger cultures and bigger bottom lines. However, the report also reveals that while 78% of talent leaders consider diversity to be the top trend shaping the future of recruiting and hiring, many of them are struggling with finding and closing diverse talent. When it comes to showcasing diversity to candidates, including photos of diverse employees in web and print materials was by far the most common strategy used by respondents (52% of them). If you’re not doing this yet, start with your careers site: it’s usually the first place a candidate will look, so it’s an ideal spot to include photos that highlight your diverse culture. Of course, it’s important that you use photos of existing employees. Job seekers are looking for authenticity in your branding, and using a stock photo could come back to haunt you. They also include a link to their blog, Inside Lever, which features articles from employees talking about life at Lever. This is a great example of how you can empower employees to share their own stories and establish a more authentic voice that will resonate with underrepresented groups. Of course, you’ll also need to pay careful attention to the details. For example, lots of career pages still show off perks like video games and ping pong tables, but these benefits can signal a culture that’s built with male millennials in mind—and may subconsciously turn off candidates that don’t fit that mold. Bringing underrepresented employees into your interview process shows that you’re committed to different points of view and opinions—a great signal to candidates that you value diversity. That’s why 35% of companies we surveyed are using this tactic. In 2014, Intel began requiring that interview panels for all new hires include at least two women and/or members of underrepresented communities. Since then, Intel’s diversity numbers have shot up. Before the new requirement, 31.9% of new hires were either women or people of color; two years later, they were at 45.1%. Another upside of diverse panels is that they help to decrease unconscious bias in the hiring process, which can be a huge barrier to increasing diversity. And, this tactic seems to work—at Cisco, they’ve increased the chances that black women will make it through the interview process by about 70%. It’s safe to say we can expect diverse panels will become an even bigger trend in years to come. Employee resource groups (ERGs)—where women and other underrepresented employees can meet and help each other handle business hurdles—are a great way to show candidates that you are committed to making them feel included once they join your company. 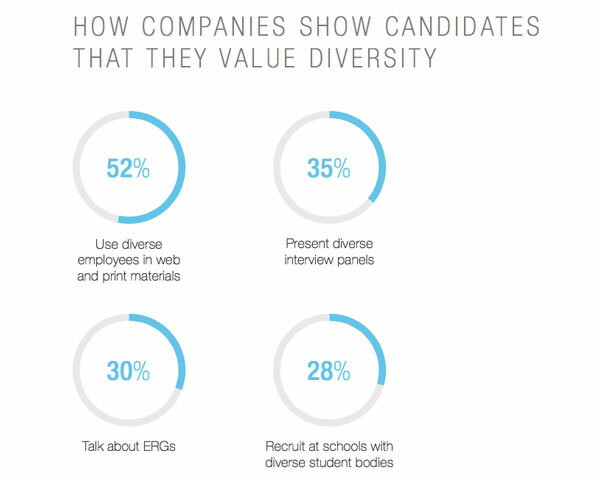 In fact, 30% of survey respondents said they talk about ERGs with candidates to emphasize their dedication to diversity. ERGs have been tremendously successful at companies like Walgreens, where several networks of employees (from veterans to members of the LGBT community) work together to advocate for diversity in recruiting, employee development, community engagement, and more. These networks have translated into meaningful wins for Walgreens. Its Disability Inclusion Network helped the company develop internal disability-inclusive technologies and policies, leading to a 100% score on the Disability Equality Index (DEI)—and attract disabled talent to the company. Around 28% of survey respondents say they show candidates they value diversity by recruiting at universities, trade schools, and community colleges with diverse student bodies. Historically black colleges and universities (HBCUs) and Hispanic-serving institutions (HSIs), for example, are a great source of high-achieving, underrepresented candidates. Wikipedia keeps lists of other minority-serving institutions, including tribal colleges and universities. U.S. News and World Report’s rankings of campus ethnic diversity is another useful resource in the US. Thinking about what schools your recruiting team reaches out to for sourcing talent can have a profound impact on your pipeline. LinkedIn went from recruiting at a few elite universities—which narrowed their reach and increased the competition—to spreading their efforts across more geographies and schools, exposing their recruiters to a much more diverse set of candidates. LinkedIn’s recruiters switched to a more efficient, regional process that involved inviting students from several area schools to career-focused events that helped them improve their professional skills and their LinkedIn profiles—even if they weren’t looking at LinkedIn jobs. As a result, LinkedIn saw a 23% increase in minority hiring within their sales organization, even though it had reduced its on-campus presence by 73%. You can uncover even more diverse talent by using smart online searches. 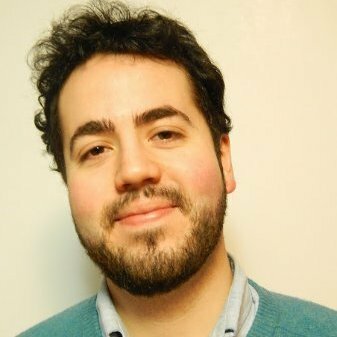 Consider the tactics used by Glen Cathey, a Boolean search master, who uses search strings to uncover high-potential candidates. One of the best ways to show candidates that you value diversity is to invite them inside your company, giving them a transparent look at your culture. In fact, several survey respondents mentioned that their companies use strategies like giving office tours to candidates—where they can meet and greet your diverse team—and hosting diversity-related events. LinkedIn recently began inviting diverse candidates to open mic nights in the office, a creative way to expose candidates to a relaxed environment that gives them a look at the company’s culture. And at Pandora, recruiters and hiring managers recently sponsored a 5th anniversary party for Coalesce Chicago, an organization that supports diverse professionals. The relaxed atmosphere in a casual space featured live music from diverse artists, and the team left for the night with over 200 new leads. Over the next year, consider your own goals for improving workplace diversity—and how some of these strategies might help you get there sooner.